The hatter in Alice in Wonderland was mad as a March hare. Hares go nuts in the spring simply out of randiness. But hatters went mad for a less uplifting reason: mercury poisoning. Mercury nitrate was used to cure felt for hats. Abraham Lincoln would also go nuts with some regularity because of the blue pills he took against depression. Elemental mercury was the secret ingredient. Ancient metalworkers appear also to have suffered from heavy metal poisoning because of breathing the fumes from molten copper alloys. This is most likely the reason that Vulcanus, god of smiths, was pictured as physically handicapped. These poor people were adults. But Swedish potter families used to suffer from wholesale lead poisoning, man, woman and child. My Jönköping colleague Claes Pettersson tells me that 18th century potters were infamous for their hot tempers, constantly getting into fights and doing jail time. Potters' children were known to be sickly and prone to simplemindedness. This all had to do with lead-based pigments in the glaze on the pottery of the time. Firing a few months' worth of pottery was a momentuous and festive occasion, perfect for a family gathering. 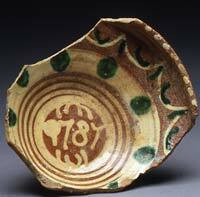 But when fired, the glaze gave off toxic lead fumes. Poor kids. One last tale of lead poisoning. In 1848, Greenland Inuit witnessed the zonked-out trek of a group of clearly cognitively challenged Europeans across the snow fields. They were the last survivors of John Franklin's ill-fated Arctic expedition: their ship had been frozen into pack-ice and most of them had gone barking mad. This was because of the hi-tech provisions they'd taken aboard: tinned food. Actually, the food was more leaded than tinned, the cans having been soldered shut with liberal amounts of lead. These days, we know better. No lead in Tupperware. But still, Tupperware happens to have killed its share of northwest Inuit -- through botulin poisoning. Northwest Inuit traditionally make and eat fermented whale blubber, a real treat, I'm told. But if you stick the blubber in a plastic box in the fridge, you create an anaerobic environment where few microbes will survive. Among those that thrive, though, are botulin bacteria. Don't try this at home, kids. Well this is food for thought (Duh, get it?). Your site is one of the most interesting and eclectic I've ever come across. Thank you! Warms my heart!